Jimmy Hayes' old coach from Topeka Frank Magee recounted stories from his career to The Topeka Capital-Journal in 2018 and one of the stories centered on Hayes. Magee spotted Hayes between a doubleheader sitting on the bench as teammates went to the concession stand. Magee sent Hayes with some money to buy himself a soda and Magee one, Magee told The Capital-Journal. "Three days later," The Capital-Journal wrote of Magee's account, "Hayes walked from his home in central Topeka and knocked on Magee's door to pay back the dollar the soda cost." Hayes would find himself walking elsewhere, on a professional baseball field. He played parts of four seasons as a pro. He never made AA. Hayes' career began in 1987, taken by the Tigers in the third round of the draft out of his native Topeka, Kan. Hayes was also credited as Jim Hayes. Hayes started with the Tigers at rookie Bristol. He started 11 games, but went 0-7, with an 8.35 ERA. He returned to Bristol for 1988 for another 12 starts. He went 3-6 that year, with a 4.05 mark. Hayes moved to the Cardinals system for 1989, but saw limited playing time. He got one start at single-A Savannah, where he went five innings and gave up two earned in a win. He also saw four outings in the rookie Arizona League. 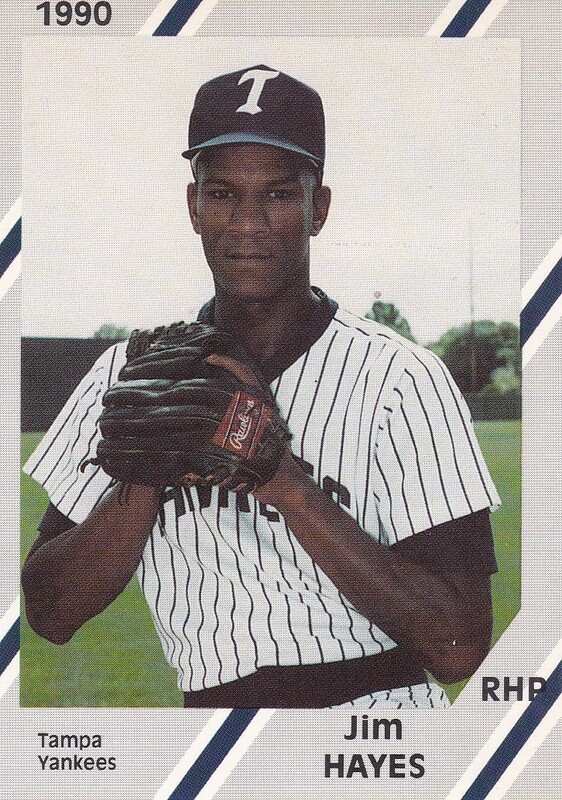 Hayes signed with the Yankees for 1990. Assigned to the rookie Gulf Coast League, he saw 11 relief appearances, picked up two wins, a save and a 4.15 ERA. Those outings marked his final outings as a pro.